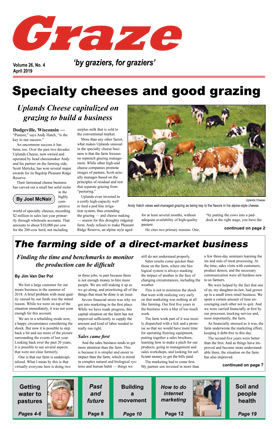 If you have a product or service that can benefit small- and moderate-scale dairy and livestock farms, Graze may be your best advertising investment. We offer a loyal, targeted audience for your message in a highly readable format. Who reads Graze? The majority milk cows for a living, many are selling organic-certified milk and meat, and a substantial percentage do not have access to the Internet due to religious or personal beliefs. They are innovators who are willing to try new products and services, and share the news with their neighbors. Please contact us for information on circulation, rates for for display, directory and classified advertising, and options such as inserts, color and nonstandard ad sizes. We’re glad to help in providing your message to our unique audience. Deadlines: Typically, space for display, directory, and classified ads must be reserved by the 1st of the month preceding the issue month. For the two combined issues—June/July and August/September—deadlines are May 1 and July 1, respectively. Contact us for exact deadlines and more details. Publisher reserves the right to decline any advertisement.